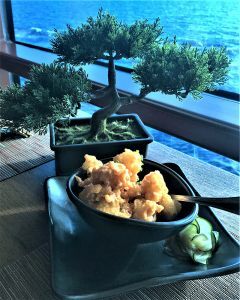 Specialty Dining on Celebrity Cruises: Worth it? You paid for your meals when you booked your cruise, yet the upselling of specialty dining packages literally begins the minute you set foot on the ship. Regulars aboard Carnival, Royal Caribbean, Princess and NCL ships have come to expect being hounded early and often – that’s mainstream-category cruising for you. But et tu premium cruise lines? For much of my recent seven-day Western Caribbean cruise aboard the Celebrity Equinox, it was virtually impossible to avoid a kiosk manned by a waiter/salesperson who by pushing a dining package is basically admitting that the food choices included in your fare are inferior. How aggressive is the hawking of food and drink packages on Celebrity these days? Swear to Poseidon, a crew member was even targeting passengers walking down the stairs during the mandatory muster drill – a first for this now-21-time cruiser. 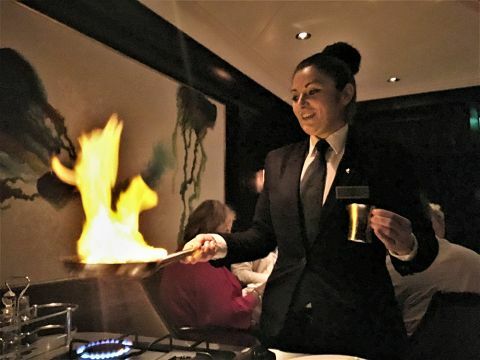 If you asked me after my 10-day Mediterranean cruise aboard Celebrity’s Solstice-class Reflection, I’d say probably not, and that’s not a slight on the specialty restaurants. Ninety-eight percent of what was served in the main dining room, buffet, Blu (a restaurant exclusive to AquaClass guests) and Luminae (for suite dwellers) was fantastic. The “free” food being so outstanding on Reflection made dining at one of the ship’s six specialty dining venues a nice-to-do. Upgrading lunches and dinners was often a must-do aboard the Equinox, however. If it wasn’t the coconut-crusted ham and banana-stuffed chicken breast in the Chicken Chiquita tasting rubbery in the Silhouette dining room, it was barbecue sauce overpowered with either A-1 or Worcestershire sauce in the Oceanview Café buffet. At Blu, the lobster tail was overly salty, twice, and flavorless was the plantain soup. Admittedly, these all are “first-world problems.” But when you’re paying more for premium-class cruising, one shouldn’t have to return or pass on five dishes by Day 3. Like a culinary lifesaver thrown in the direction of cruisers with discerning tastes and standards, it was Murano to the rescue. The guarantee of an incredible 5-star dining experience is worth the $50 per person cover charge. A contemporary twist on French cuisine is served in an atmosphere of unpretentious elegance. Starters include a warm goat cheese soufflé, Wellington-style diver scallops and a Maine lobster bisque that wisely puts the dissolvable dollop of cognac cream on the side. Entrees prepared tableside, always a special treat, include the Dover sole Veronique (who says deboning fish is a lost art? ), chateaubriand with béarnaise and cabernet sauce (so good we had it for an encore visit) and the signature Murano lobster, a cognac-flambéed tail with fresh basil, applewood smoked bacon and a Dijon cream that, because I’m not a mustard fan, was substituted with tomato sauce for our return. Save room for the Grand Marnier soufflé and the Les VI Etoiles du Murano, a selection of six distinctive desserts served in shot glasses. Ships with Murano: Eclipse, Equinox, Reflection, Silhouette and Solstice. Tuscan Grille is an Italian steakhouse that capitalizes on its far bow location with floor-to-ceiling glass windows that line the back of the restaurant. A modern rustic décor enhances a menu featuring 100 percent galley-made pastas, artisanal salumi and cheeses, butcher-cut meats and an extensive Italian wine list. Recommendations: (starters) crispy calamari rings, super-tender beef carpaccio and a gorgeous antipasti board; (entrees) pappardelle with ragu-braised short rib, a European seabass called branzino and the ribeye steak. So large are the portions at Tuscan Grille that we were actually thankful the tiramisu was bland and undeserved of a second bite. Ships with Tuscan Grille ($45 cover charge): Constellation, Eclipse, Equinox, Infinity, Millennium, Reflection, Silhouette, Solstice and Summit. Sorely missed on our most recent Celebrity cruise was the most unique specialty restaurant in the fleet. Qsine serves up a whimsical “dining journey” that begins with ordering from iPads and ends with picking your own chocolate-covered strawberry from a field of grass strapped to your “tour guide” (don’t call them servers). In between are the shareable courses of tasty tapas you selected, but the order in which they are served is out of your hands. If you order nothing else, get the sushi lollipops dusted with Nacho Cheese Doritos, pulled pork spring rolls (served upright in wire springs), and M’s Favorites, a sample of Mediterranean dishes that comes in an open-air case with 12 compartments. Ships with Qsine ($45 cover charge): Eclipse, Infinity, Millennium, Reflection, Silhouette and Summit. The space occupied by Qsine on Reflection is home to Silk Harvest on Equinox. The calming qualities of soft Asian décor and matching instrumental music plus a Zen-like staff made this a wise first-night choice for dinner after dealing with unpleasant port workers and a handful of rude Celebrity crew members. Food-wise, Silk Harvest scores with its siracha-drizzled rock shrimp tempura – crispy and zingy – and perfect cream cheese wontons. The rest of our order didn’t go as well. When paying extra, the pad thai shouldn’t be mushy, the chicken satay boring and the orange chicken just plain blech. Ships with Silk Harvest ($35 per person): Equinox and Solstice. The dining packages peddled ad nauseum do save you money. On week-long cruises, a three-meal package runs $109 and the seven-night “Ultimate Package” costs $199. 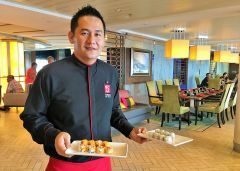 Depending on the ship, other specialty restaurants on Celebrity can include the open-air Lawn Club Grill ($45) where you can be the grill master; The Porch ($25) for fresh seafood; and Sushi on Five (a la carte prices) that serves up the best rolls and sashimi this side of luxury-category cruising.